“No groove”, because of the absence of an areolar groove (viz a viz Coryphantha and Escobaría, whose areoles have a groove). A genus of small solitary or caespitose plants, globose to shortly cylindrical. Tubercles having neither nectar glands, nor areolar groove. Spines densely covering the epidermis. Flowers diurnal, self-sterile, apical, funnel-shaped, creamy white or yellow, tinged pinkish to reddish, pollinated by insects. Fruits naked and indehiscent, floral remains persistent. Seeds brown to black, finely foveolate (pitted with very small holes). 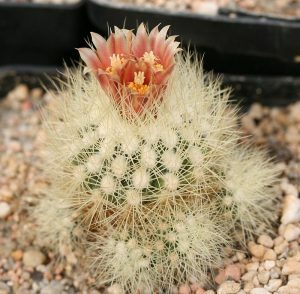 The genus Acharagma has a very restricted distribution, and grows only in the northeast of Mexico, in semi-desert, from 1000 to 2650 m in altitude, among shrubs, in the shade of bushes, but more often in direct sun, near rivers, on rocky limestone, sandstone or pure gypsum soils, in mountains, on hills, on rocky hillsides covered with a xerophytic vegetation and often in the cracks of cliffs.